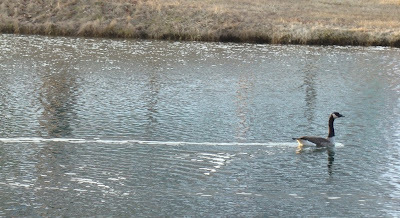 It only took 1.5 warm days to entice a resident pair of Canada geese to return to their nesting pond for a look around. They’d better not get too comfortable just yet. Snow and sleet is forecast for the weekend. I’ve lived here on Roundtop now for more than 15 years, and every year a pair of Canada geese has nested on this pond. In a few years, two pairs have nested here, but usually the second and third pairs settle in on one of the other small snow-making ponds on the property. The geese seem to prefer a single pair to one pond ratio. This was the first time since late last summer that I’ve seen the geese on this pond again. They are a little spooky at the moment, though that typically passes. The geese apparently winter nearby on one of the larger ponds in the area. It’s not uncommon to hear geese in the winter or occasionally to see a few flying around but they don’t stay at this pond. Sometimes the geese don’t raise their young on this pond. They nest here but as soon as the young can travel, they march them all to one of the other ponds. Sometimes, they do raise the young on this pond, and in those years they will stay until the young ones can fly. There’s no predicting what their preference will be this year. I'll just have to wait and see. Twenty days after my first photo of "experiment #2," I’m posting the second photo. I’ve been trying to get my second photo for most of this past week, only to have clouds hide the sunset at the last moment. Last night was at least my third attempt to get the second photo. As you can tell, the sun has moved quite a bit to the north over the past 20 days. 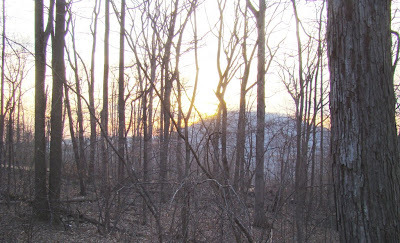 Sunset is now almost to the top of Nell’s Hill, and in the first photo sunset was very near the base of the mountain. The snow has also disappeared since my first photo, due mostly to several warm days a week or so ago. Yesterday it was 14 degrees when I left the house. This morning it was above freezing, though I still had a sleet shower this morning. I have a bad habit of tossing whatever outwear I’m using for the day over the back of a kitchen chair instead of hanging it in the closet. That way I can just grab it and go out and not be bothered with walking over to the closet, opening the closet door and removing the item (Yes, I know how lazy that sounds). This morning, the kitchen looked as though I must have had a slumber party overnight and none of us hung up our coats. I had something draped over every chair. So far this week I’ve worn my heavy parka, my regular cloth winter coat, a fleece jacket and this morning, a lined raincoat. If it warms up enough to take out the lining in the raincoat, I will have gone through all coat and jacket possibilities in my closet. And it’s only Thursday. 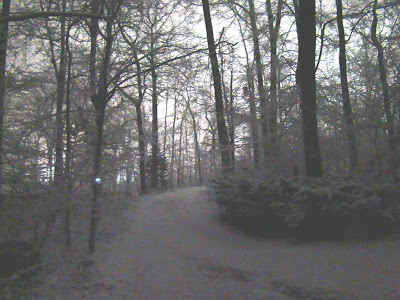 Winter here on Roundtop is running about average for temperatures. Actually, it’s a few degree days above average at the moment but as close to the actual average as it is running, a few colder days is about all it needs to peg it back to the average line. What is not average is the amount of snow fall I’ve had. Or, to put it more accurately, the amount of snow fall I haven’t had. The snow fall amount is less than a third of what I should have seen by this time. Some of the difference is that early in the season I had several ice storms. but even if they had all been snow, they wouldn’t have improved the snow total all that much. In other words, it’s been a really dry winter. That became quite evident to me this morning as I crunched my way across the remains of last fall’s leaves to take a photo this morning. In case you are wondering, it was either 12 or 14 degrees at the cabin this morning, depending on which thermometer I’m believing at the moment. It was so dry that even with this rather low temperature, I saw no frost. All in all, the morning is as lovely as this photo looks. For once the wind isn’t roaring or howling or even whispering. The morning is still and calm and when I was standing in the sun, it didn’t feel very cold at all. The dryness I’m seeing now could lead to big problems this summer. Snow is a great way for precipitation to fall. It covers everything. It melts more or less evenly and soaks into the ground. Rain, of course, often runs off more than it soaks in. So in the overall scheme of things, snow and the eventual snow melt does more to water the forest as a whole than rain often does. So when I don’t have much snow, well, let’s just say I’m already thinking ahead to summer and how that might impact the forest around me, not to mention my well. Oh, there’s still time yet for snow, and a good spring with some gentle soaking rains would do a lot to help, but this lack is already something to keep an eye on and be aware of for the months ahead. Winter is good for a lot outdoor activities, though the early darkness can be a limiting factor to many of them. When the day reaches the point that I can’t see anything when I am outside, I usually retreat to the cabin and enjoy another activity that seems best accomplished in winter—studying fieldguides. This year I am working on learning more about the local edible and poisonous plants. Over the years I’ve learned the basics of my native plants, but I’ve never felt really expert about that level of knowledge. Things like birds, animals, animal tracks and even trees, ferns and fungi were always more exciting and interesting to me. Lately, though, I’ve been feeling that I need to spend some time improving my knowledge of the smaller plants around me. In part, my interest this year is based on two things—the economy and the idea that I’ve pretty well studied most everything else already. My original hope was that I could cut down my food bill by doing some fairly serious foraging in the warmer months. I gave that idea up pretty quickly. Most of the fieldguides are kind of liberal in their take on what is edible. Edible includes many plants with medicinal uses, but far fewer that might actually end up on a dinner table for more than a garnish. For years, I’ve gathered black raspberries and blueberries. Sometimes I’ve added fiddleheads and dandelion greens to a dinner salad. I gather hickory nuts when I can get to them before the squirrels. But if I put everything together in a box, it might, just might, be enough to feed me for perhaps a couple of days. If I added a few home-caught fish to the mix, I would add a few more days to my grand total, but the bottom line is that my home-gathered food isn’t going to last me very long. This year I’m hoping to improve that dismal total a little bit. For the record, I’m not planning to eat any mushrooms, so don’t worry about that. I don’t trust my knowledge or lack thereof enough to try those anytime soon or maybe forever. I’m talking more about things like cattails or watercress, maybe burdock. Unfortunately, I don’t even hope to be able to go "off the grid" of the grocery store. I simply want to try the wild things that are out there and get a few free meals from the experience. The forest animals on Roundtop Mountain were busier this weekend than I’ve noticed in a while. The pine siskins that arrived late to my feeders have made up for that by hanging around all winter and visiting every day. The Carolina wren—I never see two at the same time, though certainly more than one is around—has also been a more regular visitor than it was earlier in the winter. Yesterday, I saw a small, fuzzy deer peeking at me from around the edge of a thicket. Judging by its small size, it was one of last year’s fawns. I’ve heard what I’m pretty sure is this same deer several times. When I walk Dog and Baby Dog late in the evening, I’ve heard it near the cabin stamping or trotting away deeper into the woods through the dry leaves. Every now and again Baby Dog will let out a bark while staring into the woods. I suspect she has scented it and is announcing that she has done so. I typically don’t see this fuzzy little deer with other deer, which is unusual. It should still be with mom or sibling or aunt. It looks healthy enough, not to mention cute as all get out in its winter coat. It is quite curious and when I’m out without the dogs, I occasionally see it. It never acts too wary and if anything, it looks as though it wants to play. Black vultures, the more southerly cousins of the more ubiquitous Turkey vulture, are now gliding overhead again on sunny days. The animals take advantage of every warm and sunny day to get out and about. No longer do weeks pass with them and me holed up in a warm spot. Winter isn’t over, but the sun is now stronger and warmer than it was just a week or so. There’s a sense that the days of unending cold with no immediate hope of a warm-up are passing. Oh, it will be cold again before spring, but even on cold days the sun feels warm. For today, that’s enough. I’m a tad bored with how the forest looks today. I know it’s just me. I know it won’t last. It’s just that not a lot is going on in the woods right now. 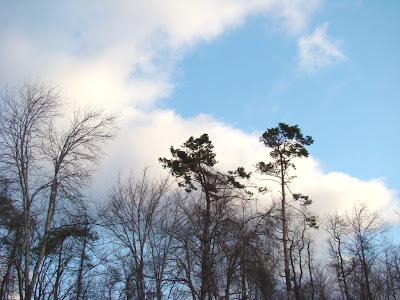 During my mid-summer doldrums, the forest seems not to change very much, and today I see the same thing but during winter. In summer, I’m surrounded by an unending sea of greenery, and I reach a point where I long for something different. Right now I feel the same way. I have a lot of brown in the landscape and not much else. I don’t see much new or much different to look at. My need for variety is not being met at the moment. Now, don’t get me wrong—I’m not looking for anything as dramatic as a blizzard or, heaven forbid, another ice storm. I’m just hoping for a little spice, a splash of color, a pretty sunset, a semi-unusual bird or maybe a sighting of the coyote that I haven’t seen for a year. Something like that to contrast with the ocean of brown around me, to grab my attention, if only briefly. I know it will come. It might be tonight or tomorrow. It could take longer, though I hope not. I do know it won’t take long. That’s the way of the woods. Nothing stays the same for long. It’s not spring here on Roundtop, and if I had any doubt of that I did have snow and sleet yesterday. Barely-late- or late-mid-February is never spring, though I am already starting to see inklings of of the season's change around me in the forest. Scent: Even with yesterday’s little snow, the forest air no longer has that crisp, cold scent to it that associate with winter. The scent also certainly isn’t the scent of warming ground. It’s something in between. Sound: Birds are singing in the morning again, and it’s more than just the cardinals who will sing at the drop of a hat, even in mid-winter. 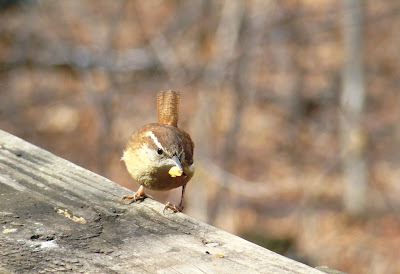 Now, it’s also the Carolina wren and the titmice and the twittering of the juncos. Sight: Birds and animals. Northern flickers don’t actually migrate but they often travel down off the mountain and into sheltered valleys to spend the winter. They are back up on the mountain again. Turkey vultures and even a black vulture or two ply the skies on warmer days. Rabbits are out all the time. Last night I had a raccoon on the back deck again. It was raiding the bird feeder. These aren’t signs of spring. They are simply signs that winter is easing and that the depths of the season are past. Another cold spell, another storm will send birds and animals scurrying back into roosts and dens to wait it out all over again. But when that happens the retreat won’t be for as long nor the storm’s aftermath as severe. The days are lengthening and the sun sets ever further in the north each day. Snow is in short supply here this winter. Oh, I see an inch or two or three but every time a half-decent storm appears, it ends up as ice or rain. The snows I have had, such as they are, have been pretty little things. The snow sticks to every little twig and blade of grass or winter-deadened vine, so the mountain looks sugar-coated. Of course, the slightest breeze dislodges the powdery stuff, but until that happens it’s really pretty. I had one of those pretty little snows the other night and tried to get a photo before a breeze knocked it all off the trees. The resulting photo doesn’t look quite how it looked that night at the cabin--all white and fresh and still--but the result I did get is still okay. This delicate little snow didn't survive much past the next morning's sunrise. The temperature never warmed above freezing but the sun is brighter and stronger now and even a cold sun is strong enough to melt snow. Winter is already more than half over and the sun grows stronger ever day. Living in the woods brings not just me into closer contact with forest residents. Even my indoor cats gets to see more of them than is likely the norm. The bird feeder, of course, is an ever-fascinating source of entertainment for them. But it’s not just the birds they get to see. 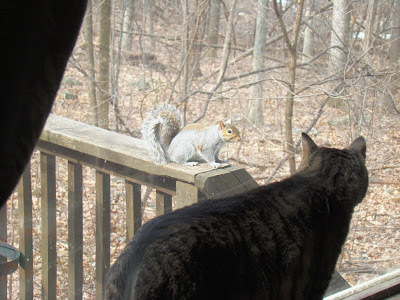 Saturday brought a squirrel and cat encounter that was even closer than what you see here. For a few seconds the squirrel and the cat were within half an inch of each other, though separated by two panes of glass. Each stared at the other, and they even appeared to "touch" noses at each other. Unfortunately that was a photo that didn’t get taken, mostly because the cat’s body blocked the view of the squirrel right beside it. Even the indoor cats aren’t limited to seeing just birds and squirrels, though. One day both were glued to the window staring outside, so I had to look, too, to see what they were finding so entrancing. That day I discovered a red fox nosing around in the brush just a few feet behind the cabin. We all got to watch it poking under downed logs and sniffing the leaves for several minutes before it finally moved on. Who knew that cats would be so interested in a fox? Deer are commonly seen by Dog and Baby Dog during our morning or evening walks. There’s nothing that gets a dog revved up quite like the scent and sight of a deer. I have the arm muscles to prove that one. I suppose the cats have seen deer, too, but they don’t appear to care about them one way or the other. Raccoons also rev up the dogs, and when I hear Baby Dog’s full-throated roar of outrage, I can almost bet one of the raccoons is up on the front deck. The cats tend to be more interested than outraged by the raccoons, and I’ve seen a few almost scarily close encounters between them. All that separated them was a rather rickety door screen, and I thought that was just a little too close for my comfort, if not theirs. Either side of that encounter could likely have torn through that old thing without drawing a deep breath. The wind that howled across the mountain yesterday no longer shrieks nor drowns out conversation. The relief is almost palpable as the forest life around me resumes to something approaching normalcy. Yesterday, Dog and I walked right up to a deer at the end of the lane, startling both me and the deer, though Dog reacted faster than either of us and was ready to herd it (as I would say) or chase it (as another might claim). The wind was so loud and from a direction that did not reveal us to be so close until we were nearly on top of it. This morning, we heard the same deer in much the same location, but it also heard us and stomped away before we could see more than the white flag of its tail. Temperatures are now falling from their record-high levels to near normal ones, as well. Tonight the mountain will fall solidly below freezing again for the first time in nearly a week, though I had skim ice in the puddles this morning. In other words, the local trees likely won’t be affected by this brief warm-up and will go back to slumbering again, if they aren’t already. So winter is not yet dead, for which I am grateful. In these days of milder winters, normal feels like something of a gift, the gift of one more season where the forest can continue as it has for millennia, where the threat of climate change is for the moment still more threat than reality in my little corner of the forest. Normal is relative, of course, but I take what comfort I can find, where I can find it. Wind scares me more than just about anything else does here in the cabin. The idea of one of the large oaks toppling over and hitting the cabin is never far from my mind when the wind howls as it did last night. Winds gusted over up to 60 mph and were sustained at not much less than that. Anything that wasn’t nailed down disappeared. The dog gate fell over and banged on the back deck. I heard some kind of metallic clanging somewhere down around Roundtop. I lost power several times, though not for any length of time. I didn’t get much sleep once the wind started. 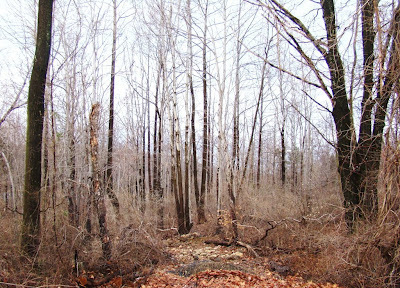 Once, a large tulip poplar perhaps 30 feet from the cabin toppled over in an east wind (not the typical wind direction here) and took out a total of 16 other trees with it. I counted them because the whole fiasco surprised me too. A few of those were also good-sized trees, with the rest smaller ones. I wasn’t at the cabin when that happened—probably a good thing. The tree still lays where it fell. The uprooted base served as a fox den for at least one litter of kits. I have been at the cabin when other trees have fallen in the forest. For the most part I don’t hear them when it happens. I feel them, like a little earthquake. The ground will vibrate under my feet for a few seconds to a greater or lesser degree, depending on the distance and the size of the tree. Sometimes when the trees are fairly close I can hear them hit the ground. That invariably sets the dogs to barking. Fortunately, the large oaks that surround my little cabin are still standing this morning. They all look healthy enough and are straight and tall. It’s just that when the ground is soft and the wind is high, well, things can happen. 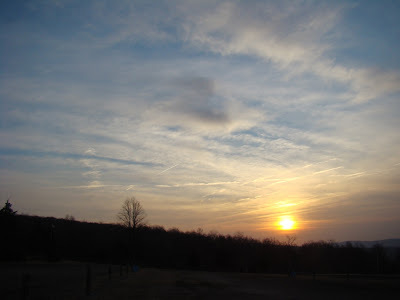 Sometimes a sunrise is more than a just pretty sunrise on a February morning. 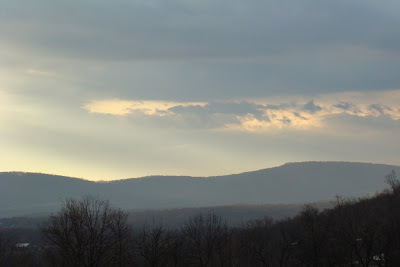 I saw this view as I was leaving the mountain this morning, and the first thing I thought was that this sunrise means rain. Not the heavy kind of all-day soaking rain but the showery kind of rain. And not even a wide-spread event but the kind where tomorrow I run into someone who lives about 5 miles from me and they say, "We had a nice little shower yesterday." Then, I say, "Huh! I didn’t get anything." That kind of rain. This is the kind of sky that can delude you into thinking it’s not going to rain at all but if you’re camping and you don’t put the tent fly up so you can enjoy a nice winter night during the February thaw, you can be sure you’ll wake up in the middle of the night to the sound of raindrops on the tent and then you have to get out of your nice warm sleeping bag and fumble with the tent fly in the dark. That kind of rain. Amazing, isn’t it, how one little sunrise can tell such a story? Likely this thaw won’t last. It’s not uncommon to have a January thaw in this area that lasts for several days or a week. We didn’t have a January thaw this year. It waited until February for that. If this thaw lasts more than a week or so, it will be both unusual and cause for concern. 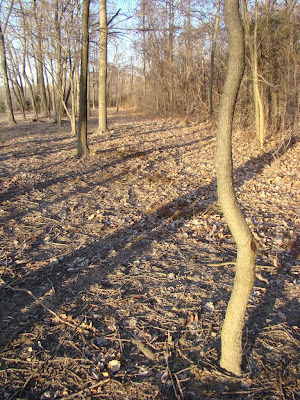 Rising sap could cause the buds to appear and everything from fruit trees to dogwood blossoms could then be damaged or destroyed when the weather returns to normal again. But for a few days, I won’t worry about that just yet. For now, it was enough to be out in the sun on a warm day and enjoy a vacation from winter without ever leaving the area. At this point, one or two days into the thaw, there’s no sign of spring. There’s simply mud and decaying leaves, wet and flattened from weeks of being covered by snow and ice. This is a good thing. It means last year’s leaves are already turning into forest loam. 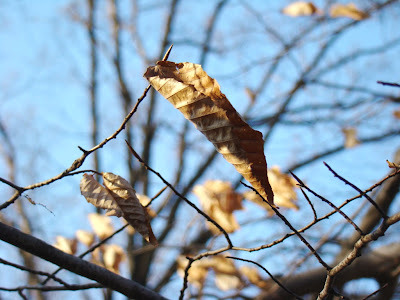 Some years, when it is dry through the winter, last year’s leaves greet the spring still crunchy and not much decayed. A normally wet and snowy winter moves that process along nicely. The other thing I noticed is the number of trees with marcescent leaves, such as those in today’s photo. In this area, that pretty much means I’m looking at a lot of American beech trees, though a very few others, often oak, will have them, too. Marcesence simply means that the trees hold on to their leaves until the new leaves push them off in the spring. Sometimes, as the new leaves are just starting to come out, you’ll see both the new leaves and last year’s leaves on the same tree. Scientists argue about what causes marcesence and whether its effects are positive or negative. Sometimes one will say the effect is positive when another calls the same effect negative. I find their arguments interesting but so far have found nothing in them to get overly concerned about. 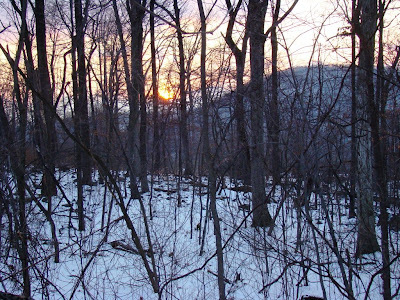 Here on Roundtop, marcesence on beech trees simply is a normal way of the forest’s life. 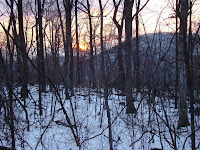 Seeing this pretty winter sunset last evening has given me an idea for another one of my experiments. 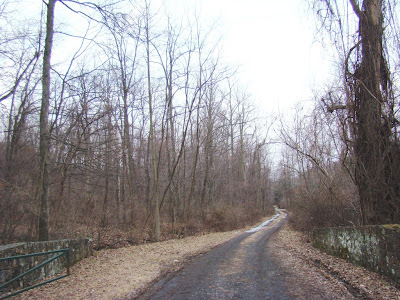 Long time readers of Roundtop Ruminations might remember that last spring I took one photo a week of the same spot in my back forest so I could see how that spot went from winter to summer. If you’ve forgotten or want to see the results, check my Labels for the blog and look under "Experiment." Here’s the short version: for several weeks you didn’t see much change and then it suddenly "exploded" with greenery. Anyway, while I was looking at the sunset last evening, what I noticed was how far to the south the sunset was, much further than it is in summer. This sun is now setting in the southwest. In summer, it will set in the northwest. So I’m going to occasionally show where the sun sets, likely no more often than once a month. I should have taken a photo on December 21 when the sun was at its furthest point to the south, but I didn’t have the idea then. At some point, likely in May, I will need to move take my photo at a slightly different spot than I am today, because the summer greenery will block my view. But the new spot will still show the same general view of Nell’s Hill (or likely Flat Mtn. to the north by then). The new series of photos will be called Experiment 2 in the blog Labels. Sometimes I think I’m just too easily amused. I had a tiny bit of snow from that big nor’easter that rolled up the east coast the other night. 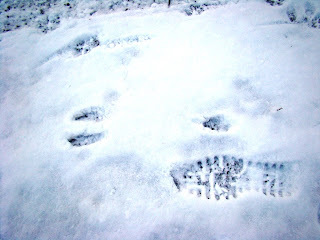 So I’ve had some nice fresh snow to look at the tracks of the animals that I share the forest with. Partly because I’ve been holed up in the cabin to avoid the ice that has covered the ground for the past week or so, I haven’t been out as much as I usually am. The animals, too, hole up somewhat so we are more likely to miss seeing each other than is normal. But they’re still around. 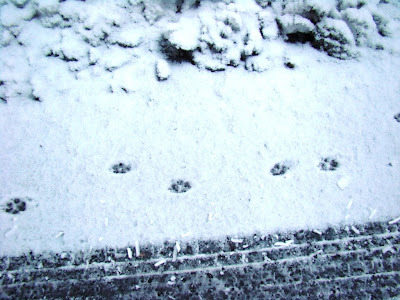 The fresh snow is great for seeing the tracks they make and reassure me that the animals are still around and doing okay. This first set is the red fox, who routinely travels down the lane. This one is moving at a nice comfortable pace, likely that easy-going trot they use most of the time. Snow isn’t the best medium for observing tracks, and powdery snow isn’t even the best of that. The slightest bit of wind or sun will start to deform the shape of the track. The track furthest on the left is the one where you can most clearly see the shape of the fox’s footprint, especially the two claws at the top of the track. The next two tracks are both rabbits, the first is one where the rabbit is just hopping along the way rabbits do. In the second photo the front and back feet are spaced further apart, which means the rabbit was moving faster than in the first set. The rabbit tracks are also in the lane up the mountain, quite close to the fox tracks, and I have to wonder if the rabbit bolted to avoid the fox (whose visible tracks don’t show that it speeded up). 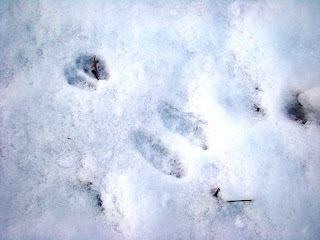 I saw other tracks too—deer, raccoon and a mouse or vole I couldn’t identify. It doesn’t take much snow for mouse tracks to be hard for me to identify. Half an inch or so and their little bellies and feet are dragging through the snow, deforming their own tracks as they move along. In any event, a quick walk around the cabin tells me a lot about which residents are around and awake and what they’re doing while I’m inside staying warm during the long, dark evenings. 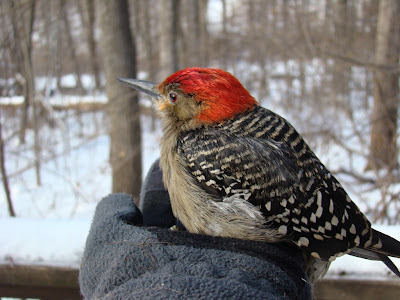 I hope it comes as no surprise to anyone that I am posting a few more of my red-bellied woodpecker photos. I do promise this will be the last of them. I was lucky enough to have my camera handy on Saturday afternoon when the woodpecker landed, though I moved very, very sloooowwwly as I raised the camera because I was scared to death that the bird would fly before I snapped at least one photo. 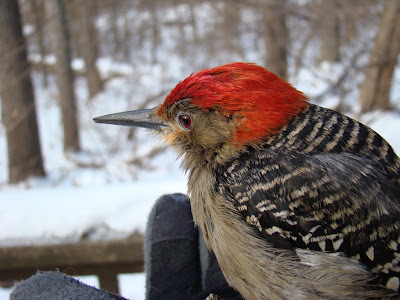 For a few brief moments, however, the planets aligned and I had both a red-bellied woodpecker in one hand and a camera in the other. The camera worked, the auto-focus worked and the photos were clear. Miracle of miracles. I guess it's okay now if I never win the lottery, because I've won another kind of lottery, one that's nearly as rare. I've studied the photos fairly intensively (as you might imagine) since I took them, and I think the bird does look a bit on the rough side, perhaps a bit worse for wear. 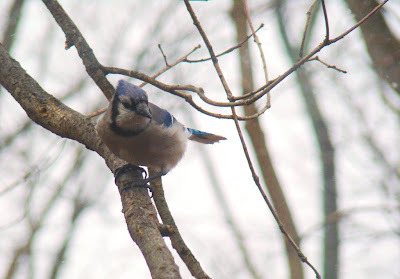 Hopefully, a few hours at my feeders helped with that, but of course I will never know.